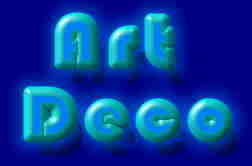 The Art Deco style first started gaining popularity in the 1890's and extended through the 1930's. The first primary showing of this style was at the Columbian Worlds Fair in Chicago in 1893. It took time, however, for the style to gain a wide adherence of followers and we do not find many pieces of silver in this style before the turn of the 20th century. 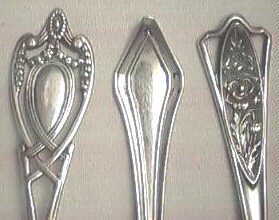 There were a number of adaptations of this style, and spoons are found in virtually all of them. Many of the arts and crafts silversmiths produced items in the art deco style, so you might want to check out the arts and crafts exhibit in this museum. 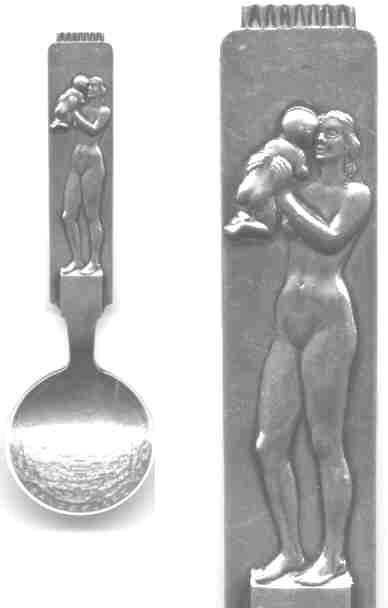 Flatware designed in the Deco style is not as ornate as Art Nouveau, because this style was a re-action to the "over decorated" style of Nouveau. Still, in the beginning there was a transition phase where certain curvy elements were used but these eventually gave way to more linear elements. 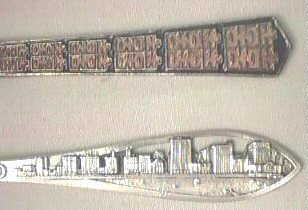 Souvenir spoons also experienced the gradual transition, and many pieces do not fit in either style completely. The Deco pieces have a more linear expression to them. Very nice and rare Art Deco woman holding aloft the insignia of the "The Agricultural College of Utah". The bowl is engraved "May 6/08". The 1888 date in the insignia is the year the college was founded. This long handled (8.75" 228mm) and heavy serving spoon has this very unusual enamel pattern on the front and back of the handle. It is marked "STG 92.5%". 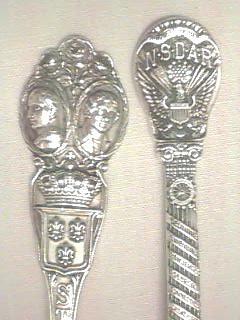 The only other times I have seen the "STG" marking indicated that the spoons were from Australia or South Africa. The enamel pattern, however, looks to me like it might be Korean. I would appreciate any comments as to style, location, use etc. Gorham zigzag style demi spoon. 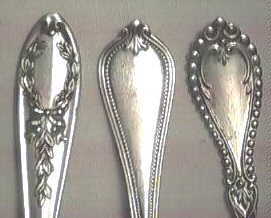 I suspect that there are a set of 6 spoons with variations on this style, although I haven't seen any. A nice hand made spoon/fork set in a zigzag art deco pattern. The mark indicates that it is sterling. The firm started in 1924 and products of the firm are displayed in several museums. This particular design was first made in the 1940's. A nice hand pounded spoon from Australia with an interesting shaped bowl, a square handle with a mid twist and a nice shaped finial. The maker mark on this spoon is MM from Hobart, Australia. Paul was unable to conclusively determine who the maker is, but he suspects that it was either Morris Middlewick or Matteo Martire. 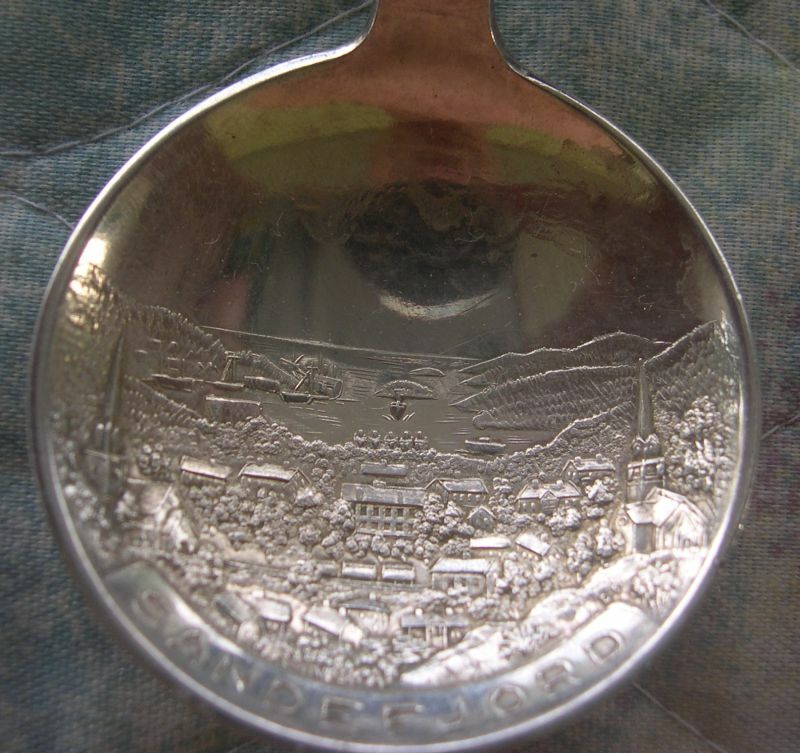 William K. from Australia suspects that the spoon is made in the style of Sargison, a noted silversmith. I am usure of how to read the markings on this spoon so I am unsure of the purity of the silver (suspect it is silver plated). I want to thank Kari M. Wefring for providing me with this information.